Magna Global HR – One of the Top RPO Companies India. We provide Recruitment Process Outsourcing services. Outsource all your Recruitment needs to Magna and get peace. Recruitment Process Outsourcing is a form of business process outsourcing (BPO) where an employer outsources or transfers all or part of its recruitment activities to an external service provider. The Recruitment Process Outsourcing Association defines RPO as follows: “when a provider acts as a company’s internal recruitment function for a portion or all of its jobs. RPO providers manage the entire recruiting/hiring process from job profiling through the onboarding of the new hire, including staff, technology, method and reporting. A properly managed RPO will improve a company’s time to hire, increase the quality of the candidate pool, provide verifiable metrics, reduce cost and improve governmental compliance. We, at Magna Global HR, as a part of our Recruitment Process Outsourcing, provide its own or may assume the company’s staff, technology, methodologies and reporting. In all cases, RPO differs greatly from providers such as staffing companies and contingent/retained search providers in that it assumes ownership of the design and management of the recruitment process and the responsibility of results. There is a lot of difference between RPO and HRO – Recruitment Process Outsourcing and Human Resources Outsourcing. While both fall under the Business Process Outsourcing (BPO) umbrella, HRO refers to the outsourcing of certain HR functions such as HR system input, paperwork processing, benefits management, compensation, and performance management. A Well Trained Team to manage SURPaaS division of work and lot of support at back end. Contact Magna Global HR Solutions for your Recruitment Process Outsourcing today. RPO uses Magna’s INTAM recruitment platform and provides outsourcing and management of recruitment processes which result in improving recruitment efficiency and reducing recruitment cost drastically. Magna has developed a range of processes and as per its cafeteria approach, the customer can pick-and-choose the processes it wishes to outsource, depending upon its needs. MAGNA brings along not just qualified & experienced recruiters but also its recruitment platform, expertise & knowledge and back-end support along with its databases, if any. Reduce Recruitment life cycle & create a sustainable & authenticated talent pipe line for future needs. Bring clarity in search / sourcing activities by shifting focus from different resume sourcing channels (portals, networking sites, employee referrals or recruitment consultants) to primary sources, i.e. other employer companies in the sector. Improve selection ratios at resume & interview stages. Provide par excellence support to the customer, so as to reduce their time & efforts in mundane recruitment activities. Bring cost of sourcing down as compared to recruiting through contingent recruitment agencies, or in-house infrastructure. Uses Artificial Intelligence and a large reservoir of Knowledge Repositories. The entire recruitment process is automated and inter-linked between RPO, its customer, candidates and its back-end recruitment service providers. Due to this platform, RPO can be operated remotely from its premises and still give better cohesive services. 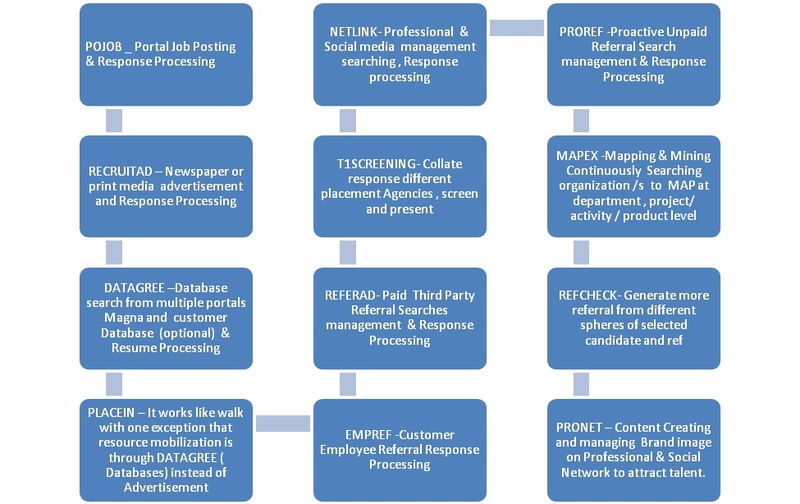 RPO has developed more than 12 methodologies that suit specific searches & sourcing needs. These methodologies are embedded in (Cloud Recruiting Platform) SURPaaS to make it automated and / or integrated. Also used for quality screening and structured interviewing of the candidate to augment human efforts and knowledge. A large Global FMCG Player was envisaging entry in Indian Market for the first time. They were looking for Senior and Middle Management Team in Sales, Marketing and IT. Unfortunately though World’s largest in their segment, they were the last entrant in India. The competition was well entrenched in India and equally a large corporation. Understanding Customer Need and Delivering at short Notice for a Large MNC A large instrumentation company from California was entering India for the First time. Magna received the mandate for recruiting Country Head or General Manager but within 48 hours.